Italian general; born at Sabbionetta, Lombardy, Dec. 26, 1838; died at Turin Nov. 2, 1904. He began the study of law at Turin, and then entered the military academy of that city. He enlisted as a volunteer in the campaign of 1859, was promoted, and took part in the campaigns of 1860 and 1861, being the first Jew to belong to the staff. In 1863 he was promoted to the rank of captain. In 1864 he fought against the brigands of Basilicata, and won the silver medal for military valor; while in the campaign of 1866 he received the Cross of Savoy as well as several other decorations. 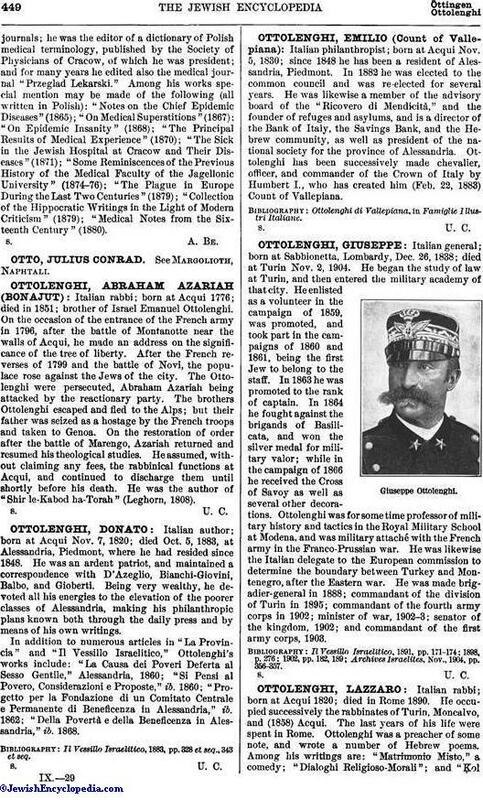 Ottolenghi was for some time professor of military history and tactics in the Royal Military School at Modena, and was military attaché with the French army in the Franco-Prussian war. He was likewise the Italian delegate to the European commission to determine the boundary between Turkey and Montenegro, after the Eastern war. He was made brigadier-general in 1888; commandant of the division of Turin in 1895; commandant of the fourth army corps in 1902; minister of war, 1902-3; senator of the kingdom, 1902; and commandant of the first army corps, 1903. Archives Israelites, Nov., 1904, pp. 356-357.